Cabot Specialty Fluids supplies solids free, non-damaging cesium formate brines (up to SG 2.3), for use as drilling, completion, intervention and suspension fluids, providing superior well control, operational rig-time savings, corrosion protection and long-term productivity. • Field-proven with over 19 years of successful well operations in more than 60 fields globally and endorsed by most of the world’s largest exploration and production (E&P) companies. • Cesium formate is monovalent with a mildly alkaline pH and as such is safer to handle and exhibits excellent safety and environmental credentials. • Our formate experts, talented field engineers and technical laboratories (Aberdeen and Bergen) provide customized fluid formulations, fluid analyses, trouble-shooting and technical support to our global clients, providing optimum fluid solutions for even the most challenging field developments. 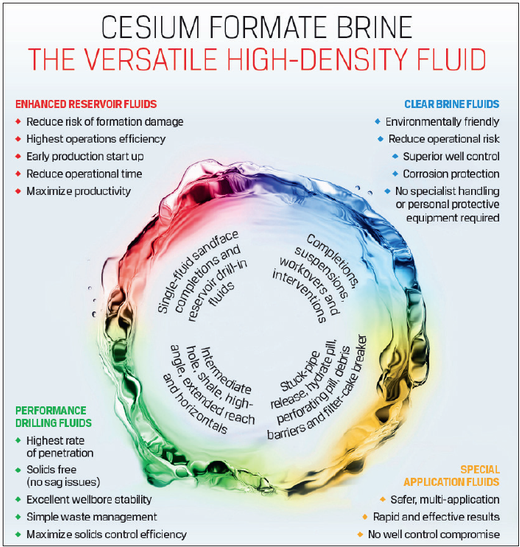 Cesium potassium formate reservoir drill-in fluid (RDI F) and solids-free brine redefines performance standards for drilling and completion of a high-pressure gas reservoir section. Delivers minimal losses, higher than anticipated rate of penetration (ROP ) and above target PI. Porous sandstone formation with coal and shale zones proved difficult for the oil-based mud used to construct the first three Martin Linge wells. Low ROPs ( average 2-3 m/hr), stuck pipe, hole instability, low productivity indices, cleanup issues and a time-consuming side-track operation led the operator to switch to a high-density cesium formate-based drill-in and completion system for the fourth well with startling results. 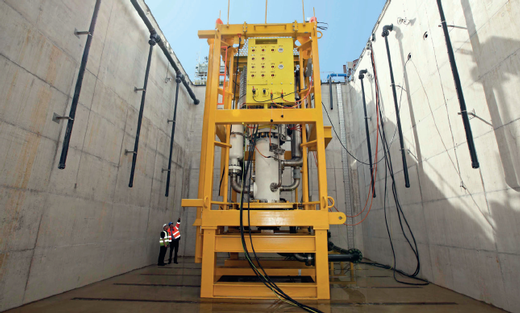 SPE -189550-MS “Deployment of Cesium Formate Drill-In and Open-Hole Completion Fluid in the Martin Linge High Pressure, High Permeability Gas Reservoir Enhances Total’s Operational Efficiency and Radically Improves Well Performance” by Eirik Jøntvedt, et al, summarizes the success of this project. Devoted solely to cesium formate fluids, no other company matches our experience, expertise and pure dedication to this unique product. AUTOMASJON OG DATA AND WISE SURVEY BECOMES WISE GROUP!